Sturdy, efficient, accurate: Breitling has created a new multifunction wrist instrument that will find its place in all cockpits – and is distinguished both on the ground and in the air by its innovative design featuring a star-shaped bezel. 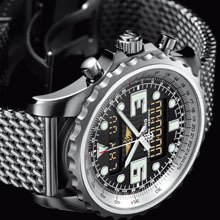 In 125 years, Breitling has launched a number of stellar models intended for pilots, including the famous Navitimer with its circular slide rule capable of handling all the essential calculations relating to airborne navigation. Today, the privileged partner of aviation is pursuing this tradition with a new model that draws upon the full potential of cutting-edge electronics. 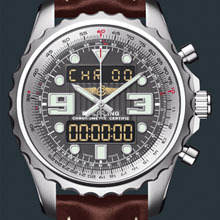 Designed for intensive professional use, the Chronospace boasts an impressive array of functions that are useful to pilots – 1/100th of a second chronograph with split times, alarm, countdown, dual timezone display with independent alarm, 24-hour military time, Coordinated Universal Time (UTC), perpetual calendar – all powered by a chronometer-certified Breitling SuperQuartz™ movement that is ten times more accurate than an ordinary quartz caliber. The large dial is distinguished by its oversized hands, along with luminescent hour-markers and large 3 and 9 o’clock numerals. To guarantee optimal readability by day and night, the LCD screens are equipped with a high-performance NVG-compatible backlighting system. The double caseback is designed to amplify sound signals up to a level of 90 decibels. The circular rack-and-pinion mounted slide rule is easily and accurately rotated using the star-shaped bezel – an original and extremely ergonomic design. The Chronospace is available on various wristbands, including a new bracelet in satin-brushed woven steel with a little vintage touch, and a sporty looking perforated rubber strap. An exceptional instrument for exceptional feats. Breitling Caliber 78, officially chronometer-certified by the COSC, SuperQuartz™ (thermocompensated quartz), analog and LCD 12/24-hour display (NVG compatible). 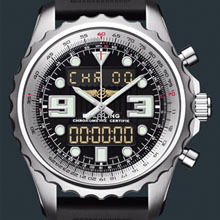 1/100th of a second chronograph with split times, alarm, countdown, dual timezone display with independent alarm, Coordinated Universal Time (UTC), perpetual calendar, battery end-of-life indicator. steel. Water-resistant to 5 bars. Bidirectional rotating pinion bezel (slide rule). Cambered sapphire crystal, glareproofed on both sides. Screwed in caseback, with resonance chamber. Volcano black, Mariner blue, Tungsten gray, Stratus silver. leather, rubber Diver Pro, rubber Ocean Racer/woven steel Aero Classic.